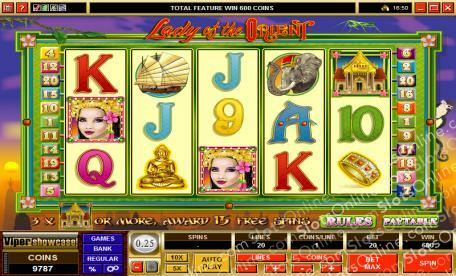 The Lady of the Orient slots are 5-reel slots with themed around the beautiful Lady of the Orient symbol. Click here to play! She lives in a majestic palace made of gold and is taken from place to place on the back of an elephant. When she must take to the sea to visit far-flung kingdoms, she travels on the finest ship to be found in the southern seas. Poker has recently been introduced to the kingdom of the Lady, and she has developed a passion for it. She has adapted the game to her own tastes, however, so the highest hands are now 5 of a kind, and there are no straights, flushes or full houses. The Lady of the Orient is very pleased when someone draws 5 Aces in one of her games, so you need not be afraid of winning. Play the Lady of the Orient slots to court one of the most beautiful women in the world, and maybe get a slice of her fortunes. The Palace symbol is the scatter in this game, and it pays out on the total bet when 2 or more land on the reels. It also triggers 15 free spins at a triple multiplier when 3 or more land on the reels. The Lady of the Orient symbol appears on reels 2, 3 and 4 only, but it can substitute for any symbol other than the scatter symbol. The bonus of this game is the free spin feature that is triggered when 3 or more scatter symbol land on the reels.